Smartphone What Is The Difference Between iPhone 7 Plus And iPhone 8 Plus? We all know very well that the tech giant Apple’s iPhone 7 Plus was released in September 2016, and just after the launch of iPhone 7 Plus, of course, the tech giant Apple launched its iPhone 8 Plus in September 2017. We all know very well that if we compare the design of the iPhone 7 Plus and iPhone 8 Plus they are very similar in design and size, but, still they have considerable differences as they are iPhones from different generations. The tech giant Apple’s iPhone 7 Plus was released in September 2016, and just after the launch of iPhone 7 Plus, of course, the tech giant Apple launched its iPhone 8 Plus in September 2017. 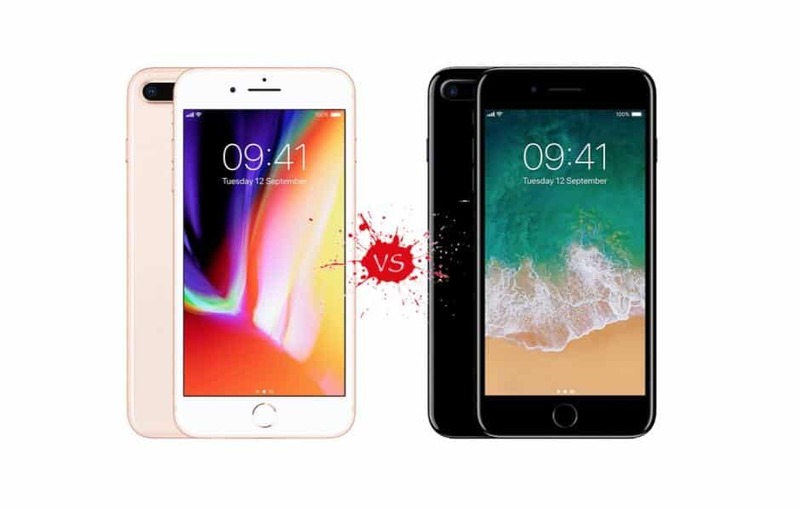 We all know very well that if we compare the design of the iPhone 7 Plus and iPhone 8 Plus they are very similar in design and size, but, still they have considerable differences as they are iPhones from different generations. In term of design, both the devices, of course, iPhone 7 Plus and iPhone 8 Plus are absolutely identical. As both the iPhone 7 Plus and the iPhone 8 Plus look the same, with the Home button front with Touch ID, and the same single-piece aluminum body. 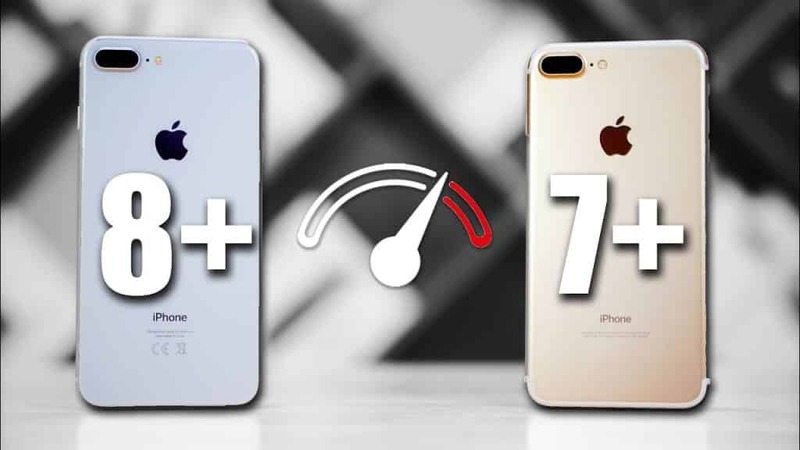 The significant difference in this aspect is the weight, as the iPhone 7 Plus weighs 188g, and the new iPhone 8 Plus weighs 202g, it means the new generation iPhone 8 Plus is 14g more heavier than the iPhone 7 Plus. The screen is also almost exactly the same in both models: an IPS LCD display of 5.5-inch, with an aspect ratio 16:9, resolution of 1920 x 1080 pixels (401 ppi) and both of them support 3D Touch as well. The advantage of the tech giant Apple’s iPhone 8 Plus over the iPhone 7 Plus is the fact that its screen has access to True Tone technology, which adjusts the color level automatically according to ambient light. While now if we talk about the camera segment of both devices, of course, the iPhone 7 Plus and iPhone 8 Plus, we have a very similar main dual setup of camera in both devices, which is a 12MP sensor with f/1.8 aperture and optical image stabilizer, and another 12MP sensor with aperture f/2.8 and 2x optical zoom. The difference is that in the iPhone 8 Plus, both sensors have autofocus with phase detection, the feature which is only present in the main sensor of the tech giant Apple’s iPhone 7 Plus. In the video segment both the devices, of course, the iPhone 7 Plus and the iPhone 8 Plus has the same abilities, as they both are able to shoot in 4K, but only the 2017 model supports doing it at 60fps, against the 30fps of the previous model. And the selfie camera is the same, which comes with a 7MP sensor and f/2.2 aperture with which we can shoot videos at 1080p at 30fps. Now, the main difference lies in the performance of both devices. As the iPhone 7 Plus comes with an Apple A10 Fusion quad-core processor which is manufactured in a 16-nm process, while the tech giant Apple’s iPhone 8 Plus comes with the Apple A11 Bionic hexa-core processor which is manufactured in a 10-nanometer process. Although not much more powerful than its predecessor, but, the A11 has implemented a number of features, especially aimed at AI and neural networks. Moreover, both the devices have 3GB of RAM, but, the tech giant Apple’s iPhone 7 Plus comes with the internal storage options of 32, 128 and 256GB, while the tech giant Apple’s iPhone 8 Plus comes with the storage options of 64 and 256GB. Not only that even the battery is also quite different in both the models. As the tech giant, Apple’s iPhone 7 Plus has 2900mAh battery, but, it is quite odd in the tech giant Apple’s iPhone 8 Plus, as it comes with a significantly smaller battery (2691mAh) than the iPhone 7 Plus. But, the fact is that the iPhone 8 Plus has the feature of induction charging, being compatible with wireless chargers that use the Qi standard. Now comes the operating system with which both the devices come out of the box was also different. As the tech giant Apple’s iPhone 7 Plus comes out of the box with iOS 10, while the tech giant Apple’s iPhone 8 Plus comes out of the box with iOS 11. However, the fact is that both the devices are now compatible with the tech giant Apple’s iOS 12, which is at the moment is the latest version. Last, but not the least, yes, now it’s time to know about the price. The tech giant Apple’s iPhone 7 Plus comes with the price tag of $569 for the model with 32GB internal storage, while the iPhone 8 Plus comes with a hefty price tag of $699 with 64GB internal storage, as it doesn’t come with 32GB internal storage version. Hence, the difference between the handsets is considerable, and both are respectively almost three and two years old according to the current dates. Moreover, both the iPhone 7 Plus and iPhone 8 Plus are excellent smartphones as compared to the newer premium models of the tech giant Apple, and will stay active in the catalog of the tech giant Apple for a long time. And not only that even we should also thank the tech giant Apple’s policy of releasing iOS updates for several years in a row for all its iPhones.